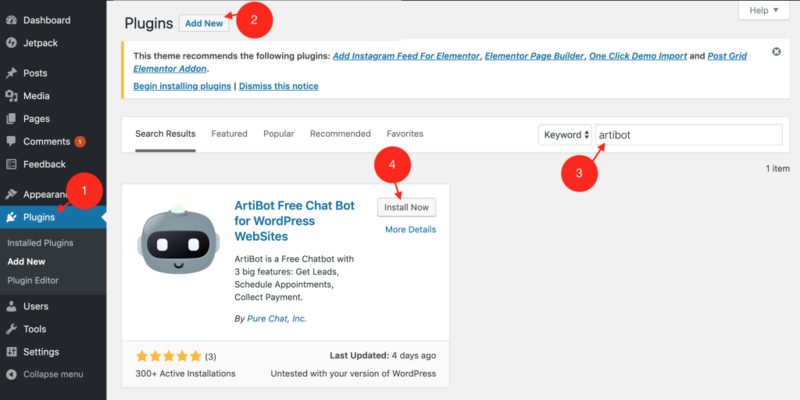 If you have a WordPress website, chances are you could benefit from adding a chat bot to automate the collection of leads and notify you when a customer wants to get a hold of you. Fortunately, there is one chat bot that does that, and a whole lot more, absolutely free! ArtiBot.ai is the only free chat bot that can collect user information, answer frequently asked questions, schedule appointments, and even take payments directly on your website. Activate the ArtiBot Plugin – This just tells WordPress that you want to use the ArtiBot plugin. If you don’t have an ArtiBot account, create a Free ArtiBot.ai Account and setup your first ArtiBot. Click on ArtiBot in the left sidebar of your WordPress admin panel to manage the ArtiBot Plugin settings. Here, you’ll want to click on the Pick an ArtiBot button and make sure one of your bots is selected in the dropdown. Now get going and add ArtiBot to your WordPress website to increase leads by as much as 300%!